What We Need is the Impossible! | Sam Green | Sam Green - Sam Green is a documentary filmmaker. He’s made many movies including most recently <i>A Thousand Thoughts</i>, a live cinematic collaboration with the Kronos Quartet. Previous “live documentaries” include <i>The Measure of All Things</i> and <i>The Love Song of R. Buckminster Fuller</i>, featuring the indie rock band Yo La Tengo. Sam’s documentary <i>The Weather Underground</i> was nominated for an Academy Award and included in the 2004 Whitney Biennial. Sam Green has been making award-winning short documentaries since the late 1990s. 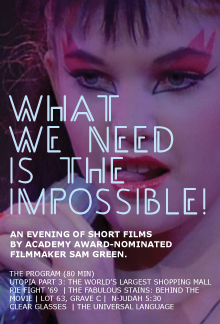 This program gathers together for the first time an evening-length program of Green’s short films, ranging from a portrait of the world’s largest shopping mall in Southern China, which is actually completely empty (Utopia, Part 3), to an elegy for Meredith Hunter, the young man who was killed by Hell’s Angels at the notorious 1969 Altamont concert (lot 63, grave c). Other films from the program include: The Fabulous Stains: Behind the Movie, the remarkable story of the cult film directed by Lou Adler in 1982. The Universal Language is a portrait of Esperanto, an artificial language that was created in the late 1800s with the hope of creating world peace, and the worldwide movement of people who still speak it. Running through Green’s films is a celebration of idealism and the search for meaning along with the often humorous realities of human folly.